There are very few differences between pigeons and doves. They all share similar features and looks, their bodies and heads are rounded, their bills are short and slim. The birds’ plumage is also of a comparable density and softness. There are five varieties of dove and pigeon native to the U.K. 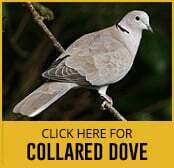 The collared dove is distinguishable from other varieties by their distinctive black neck collars. Their colour is a grey/pink with hints of brown. Their eyes are a deep red colour and their feet are also reddish. They are most often seen on their own or in pairs, but flocks do form where there’s plenty of food available. Their call is a monotonous cooing sound. They are most commonly seen around towns and villages, and are frequent visitors to gardens. They arrived in the U.K. in the 1950s after a speedy migration across Europe from the middle east. Their diet consists of seeds and grain. They can be seen all year round and it’s estimated that there are 990,000 breeding pairs in the United Kingdom. The wild rock dove is the feral ancestor of modern town pigeons. 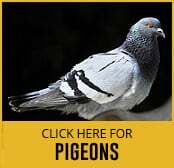 Its look is familiar to anyone who has seen the town pigeons that are widespread around the U.K. in urban areas. Originally domesticated and bred for food, modern feral rock pigeons come in a huge variety of shades, covering most of the spectrum. Some are more or less white, some are more blue, others blacker, some have pale grey feathers with darker chequered markings. Dull brick-red and cinnamon-brown varieties are also fairly common. Some still look like wild Rock Doves, being an overall grey shade with a red/brown patch on their chest and black accents on their wing feathers which are a darker shade of grey. When their numbers are allowed to increase in urban areas, they can become pests, causing damage to such areas with their guano and spreading diseases. Their main diet is seeds and cereals. Wild rock doves are now only found in the north and west coasts of Scotland, on offshore islands and on the Northern Irish coastline. 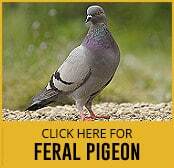 Both feral and domesticated pigeons breed almost anywhere apart from upland areas. Their highest population density is in the most populated urban and suburban areas. It is estimated that there are 550,000 breeding pairs of rock doves in the U.K. and as such, the RSPB has assigned the birds green status as they have a healthy population. As you may deduce from the similarity of their Latin names, the stock dove is visually very similar to rock doves/feral pigeons. They have similar colouration of their plumage and are of a similar size. Their colouration is largely grey-blue with a vibrant shimmering green band on the back of their necks. When flying, you can observe black edges on their wings and two partial black bands near the bird’s back. They can be distinguished from Rock doves/feral pigeons by their rumps which are not white. Stock doves are widespread in the United Kingdom, with the majority living in the English Midlands and the South West. They are absent from parts of Scotland and Ireland. Over half the European population of Stock doves can be found in the U.K., in the mating season they can be found in parkland, the edges of woodland and by quarries and cliffs. In winter, small flocks can often be seen feeding on the stubble of farmland crops. Their main diet is seeds. It is estimated that the U.K. population of breeding pairs numbers around 260,000 . The RSPB has assigned the birds amber status due to their relatively low numbers. The turtle dove is one of the more petite doves, being smaller and darker than the collared dove – only slightly larger than the blackbird. Turtle doves have a distinct mottling to their uppers which are chestnut brown and black. The dove’s black tail has a distinctive white edge. Turtle doves have a distinctive purring call which was a common sound in summers past, but unfortunately has become all too rare due to the rapid and sustained decline of the bird’s populations. One theory suggests that this is due to lack of the seed and grain which makes up the bird’s diet during the breeding season. This has resulted in a much shorter breeding season with far fewer attempts at nesting being made by the mating pairs. Unlike the rest of the doves listed above, the turtle dove is migratory, and arrives in the U.K in late April and May, leaving again in July and September. The bird is mainly an inhabitant of southern and eastern England, but has been noted as far west as Wales. It normally resides in woodland fringes, hedgerows and on open land with scattered bushes. It is estimated that there are only 14,000 breeding pairs in the U.K. which means the birds have been given red status by the RSPB as a real area of conservation concern. 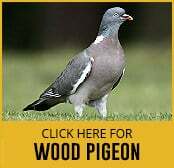 The woodpigeon is the U.K.’s most common and largest pigeon. It is mostly grey in colour, with a white patch on its neck and white wing patches which are visible in flight. In the countryside they are often shy and shun humans, but in towns and cities it is normally more approachable. Its call is a cooing sound which is quite familiar in woodland areas. They are found all across the U.K. and are equally at home in urban parks and rural woodland areas. They eat crops like peas, sprouts and cabbages as well as buds, seeds, berries and shoots. It is estimated that there are 5,400,000 breeding pairs in the U.K. The wood pigeon is currently given a green status by the RSPB.